Thanks to Dr. Raul Gonzalez, Vanderbilt University Medical Center, Tennessee (USA), for contributing this case. To contribute a Case of the Week, follow the guidelines on our Case of the Week page. 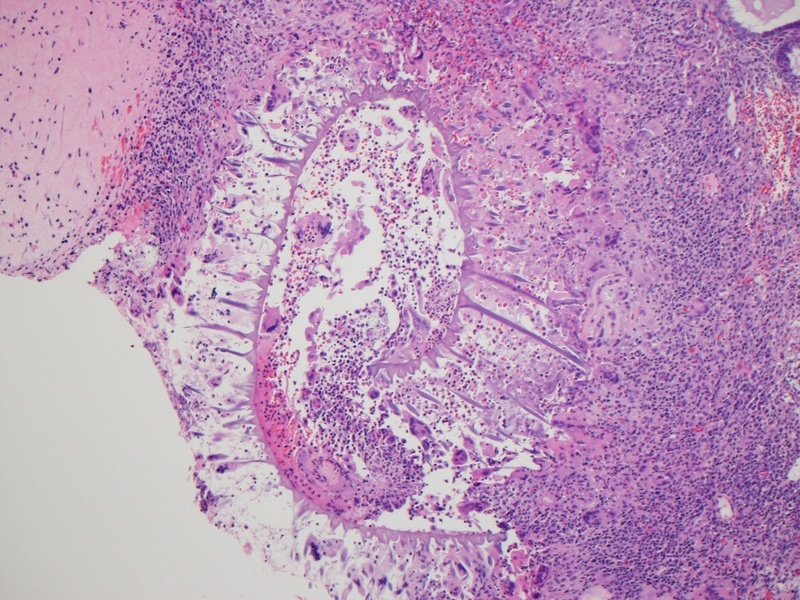 Register for our upcoming Surgical Pathology Course course being held this July in order to learn how to diagnose genitourinary, breast, pancreatic and gastrointestinal lesions. Our world-renowned faculty include N. Volkan Adsay, M.D., Kenneth P. Batts, M.D.,, Mahul Amin, M.D., and Melinda Lerwill, M.D..
(1) Our Feature page for May is Computer Software & Systems, and highlights PathView Systems, Physicians Independent Management Services (PIMS) and Voicebrook. It also contains an original short article, "Computer Software and Systems in Pathology: Spectral Imaging", by Jaleh Mansouri, M.D. (2) Visit our Surveys page, which has surveys of Computer Systems - AP/LIS. (4) Click out our Updates page to see what topics have been changed based on reviews or new images. 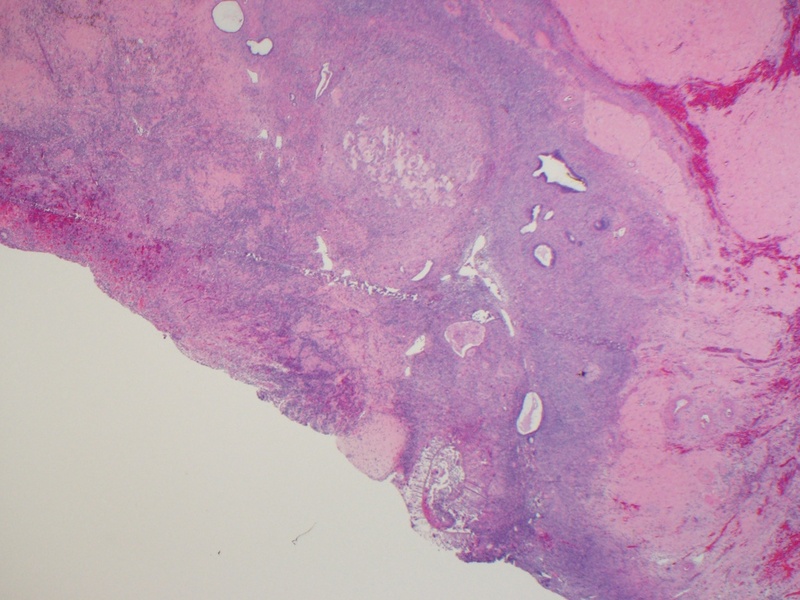 A 74 year old woman with a history of diverticulitis also had ovarian serous carcinoma. 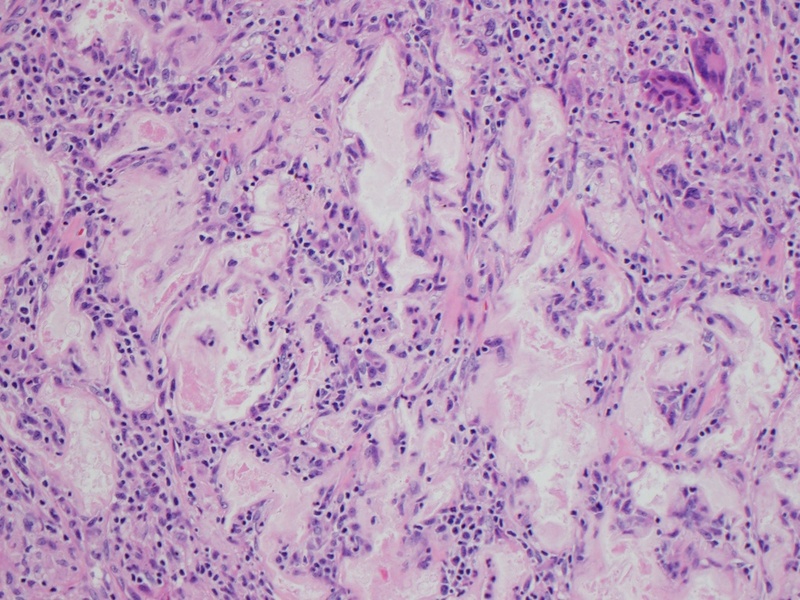 These images are of an incidental finding at surgery. 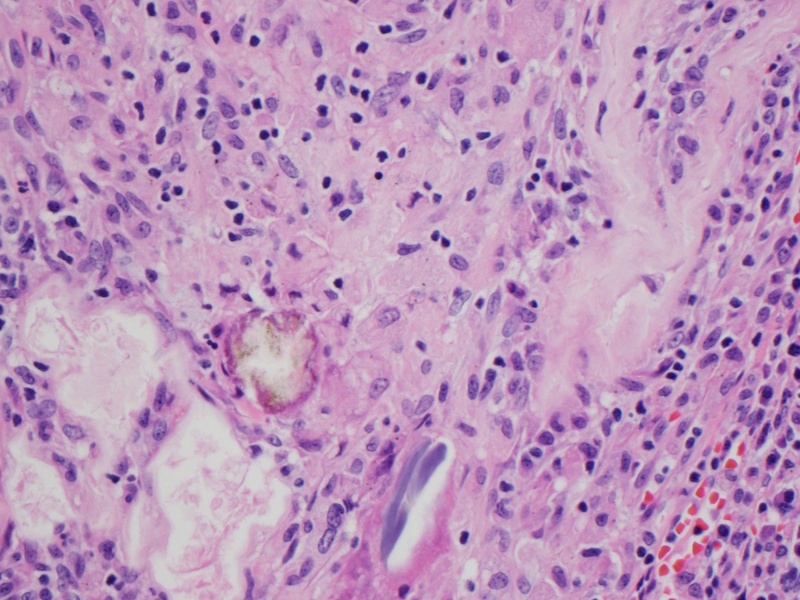 Pulse granulomas are rare reactions to food particles, characterized by clusters of small to medium sized hyaline rings (Arch Pathol Lab Med 2006;130:1839). Pulse is the edible seed of legumes. 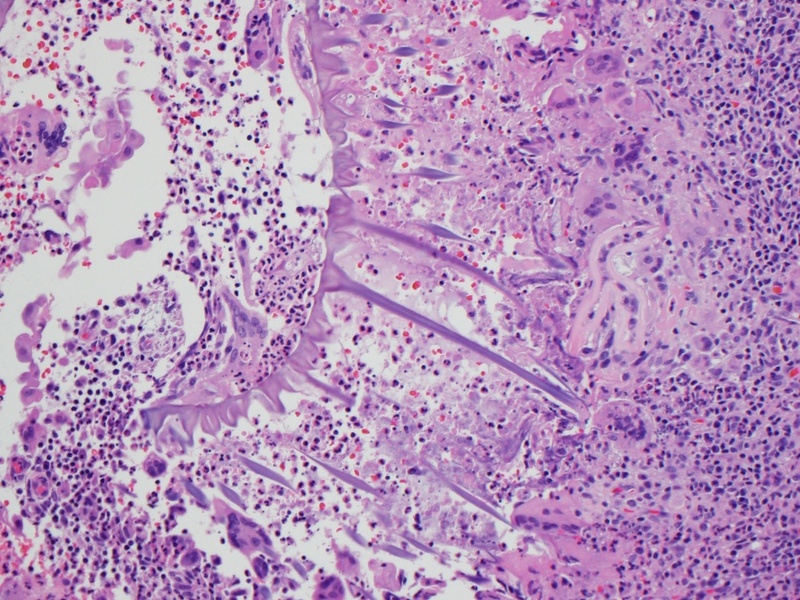 Typically, pulse granulomas are noted in the lungs (associated with aspiration), and in the oral cavity / mandible / maxilla or other portions of the alimentary tract. However, due to their presence in diverticulae (Pathologica 2013;105:59) and fistulae (J Cutan Pathol 2008;35:343), they may also be found in the gallbladder, fallopian tubes, skin and other organs. They may also be caused by surgical displacement of vegetable matter (Int J Surg Pathol 2008;16:96). No cases have been reported in the literature involving the ovary. 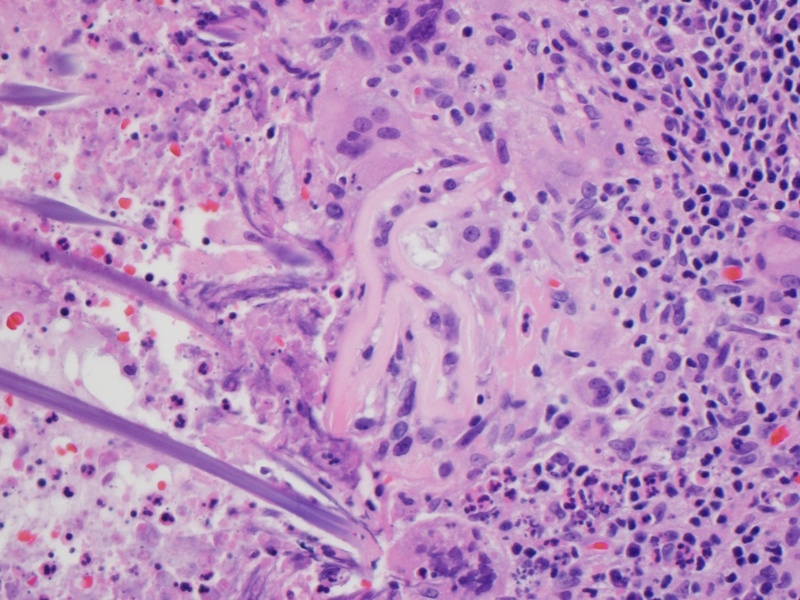 Histologically, pulse granulomas typically contain thin, faintly eosinophilic hyaline rings mixed with acute and chronic inflammation. The lumina of the rings contain inflammatory cells, erythrocytes, fragments of eosinophilic hyaline material and calcium phosphate. Foreign body type giant cells are usually present, but vegetable matter may not be identifiable.